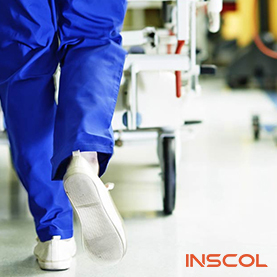 In the field of healthcare, nursing is an option chosen the most for the unending opportunities it brings along. However, one does not choose nursing but gets chosen by this profession because being a nurse demands longer working hours and the strong will to empathize with the patients through their healing process. There’s no place for fatigue, mental breakdowns and bad days in the life of a nurse for the simple fact that a patient’s medicine alone cannot demand a cure. So, keeping it simple, one must research in depth before choosing to be a nurse, and make sure it’s the right choice for them. Being a nurse can open a gateway of international opportunities for you if you plan to take the giant leaps coming your way. It is a well familiar fact that developed nations like Canada, Australia, New Zealand and UK have a wide array of employment opportunities for nurses who want to start their international journey. Most of the aspiring nurses or nursing professionals choose to settle in Canada because of the simple reason that the country has an alarmingly high population of sick and old people who are in a dire need of nursing services. To be able to settle as a registered nurse in Canada, the best possible way is to study reliable nursing programs in Canada. Studying nursing courses from the country where you plan to work in full capacity enhances the scope of getting better working opportunities and at the same time makes you familiar with the different working styles being followed. So, after knowing a bit about making the right choice as a potential nurse, let’s further hop on to know more about who is labelled to be a registered nurse and what are the job responsibilities associated with being a registered nurse in Canada. 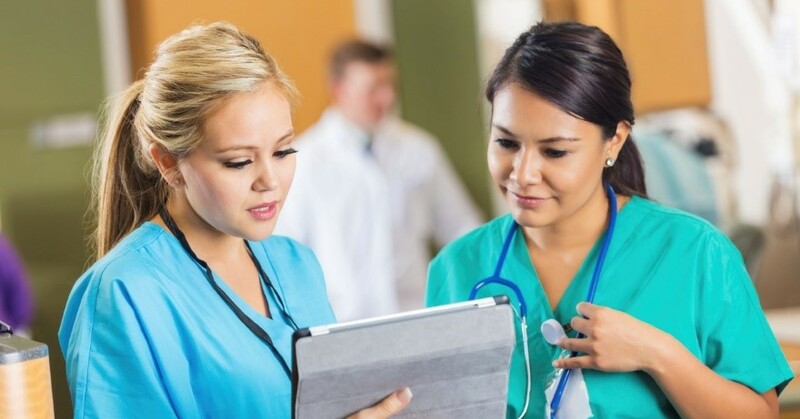 In the field of nursing, it is important to get yourself registered as a nurse before delivering the professional nursing services to your patients. To be a registered nurse, you must be a high school graduate and must have done a valid nursing course from any designated institute of learning. There is an abundance of opportunities for the healthcare professionals migrating from developing nations to Canada as the country has a pressing need of healthcare service providers and positively, nurses make the most of these opportunities. 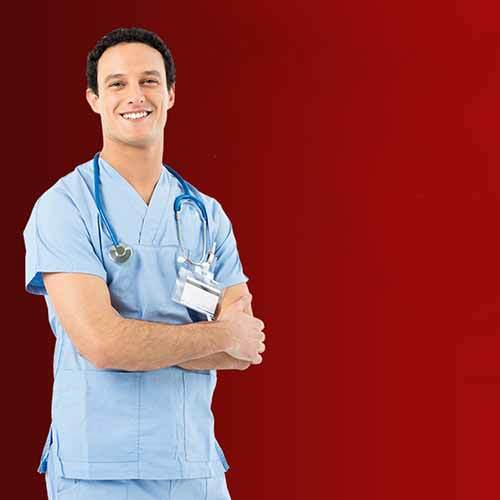 The procedure to become RN in Canada has a number of steps to be completed but these can vary for international and domestic students on the basis of their country of origin. Well, apart from the mandatory job responsibilities, there’s a lot more which goes into working as a registered nurse in Canada and the video below provides keen insights to the role of registered nurses in Canada and how they aim to bring a wave of positive changes in the healthcare system. So, to begin with, you must have a post-secondary educational qualification as this could be your entry ticket into nursing. 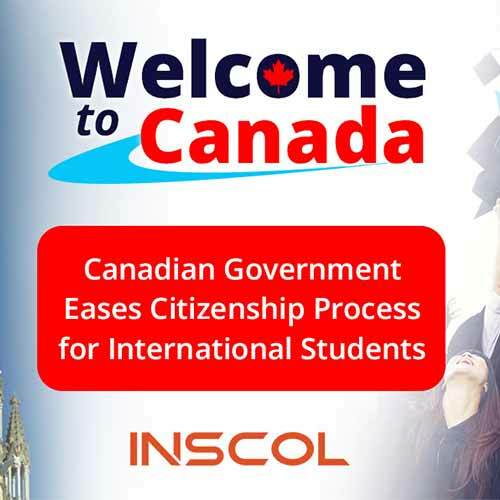 However, for international students, completion of a nursing program in Canada is considered to be an important parameter to be able to provide efficient and effective patient care for Canadians. Being an international student, you must choose to study global nursing programs which are equivalent to a 4 year graduation program or a post graduate certificate program. This will act like a bridge course and enable you to choose a specialty, best suited in your interest. Make sure to attain sufficient clinical experience and practical skills as a part of the program in consideration. 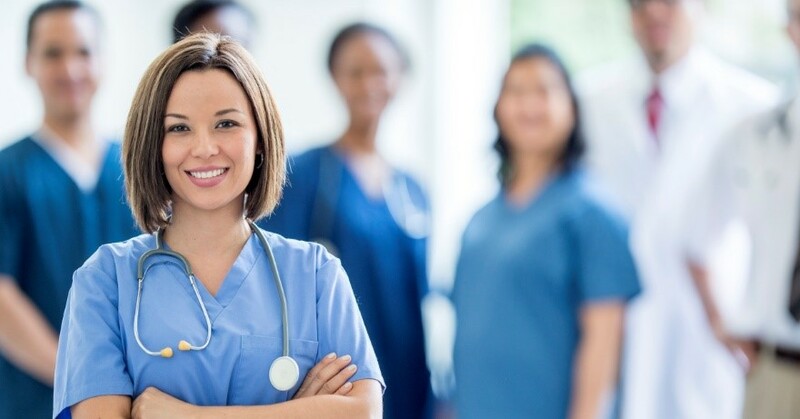 With the completion of your nursing programs in Canada, you can be eligible to take the RN exam and start working as a nurse in a full professional capacity. Followed by this, is the NCLEX examination which every aspiring RN must take and qualify for. Successful clearance from this examination determines that a candidate is well-equipped to practice entry-level nursing. Along with this, is a mandatory English proficiency requirement where every international nursing student should have a certification stating that they can communicate in English because it is the first language for Canada and will be used the most to interact with patients and their counterparts. 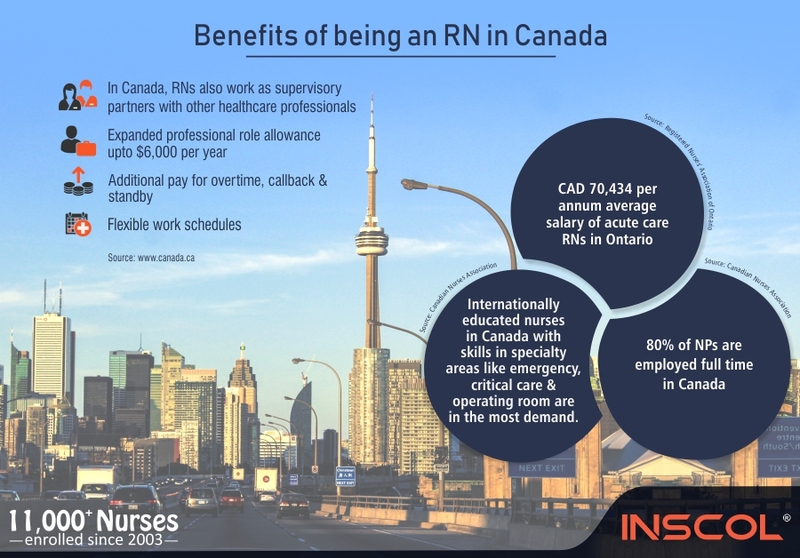 First and foremost benefit of working as a registered nurse in Canada is that you get to earn an average salary of CAD 65,000 annually which is comparatively higher than what is being offered in developing nations. The high paying scales for RNs make their job equally respectable as that of a doctor or any other high rank healthcare professional. Working as an international nurse can also offer sufficient day offs which get compensated against the each extra hour that you work. Also, the real advantage kicks in with the fact that these 13-15 days annual offs are paid and don’t take you on a guilt trip. Yet again, striking a comparison, it is difficult to imagine such a scenario in the developing nations where scarcity of nurses is no less than a crisis and it makes them work overtime without any competitive benefit being granted. Being a healthcare provider yourself, you get an access to comprehensive health insurance plans which cover you and your family members. Being a registered nurse in Canada also provides a much needed facility for all the working parents who need help in being available for their kids. To ensure full attention being given to the kids of nurses working at odd hours, many hospitals and institutions provide the facility of child care where the kids can be taken well care of, as and when required. Being a registered nurse can also bring along friendly tax saving plans which help you to contribute a part of your salary to savings account. Say, there are hospitals which match 100% of 3% of your salary. In easy words, if you are making an annual remuneration of $100,000 and contributing $3,000, the hospital will match it and turn it into $6,000. It’s important to consider the salary and remunerations you are entitled to as a registered nurse in Canada because of the simple fact that it’s one of the important factors which keep the nurses going. There are a lot of factors which contribute towards deciding the basic salary of a nurse, depending upon the area of specialization and the working hours being put in. Since, Ontario is one of the most preferred locations for nurses to work in Canada, the hourly wages in the province begin from $20.23 per hour and they can go as high as $45.82 per hour. After the essential daily wages, comes the overtime pay which is usually one and a half times the hourly rate but can tend to vary in different regions. 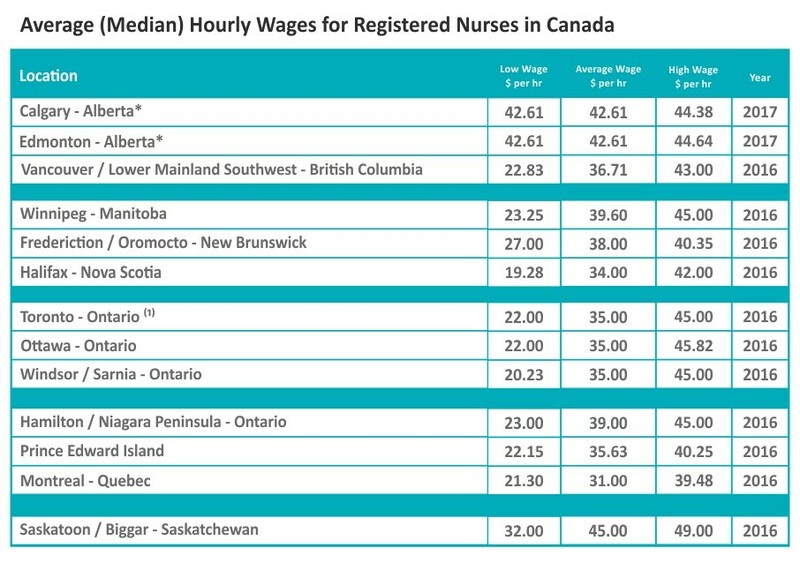 Apart from Ontario, there are a handful of other locations as well which provide a decent wage rate for the nurses. Mentioned below are a few essential details about the varying pay scales in different regions of Canada. The data is sourced out for the year 2016-2017 and clearly focuses on the hourly wages ranging from low to high and settling in for an average wage rate per hour. Fact source: Living in Canada After computing a full-time annual salary scale for registered nurses, the value ranges between CAD 65,000 – CAD 85,000. When this is compared to the wage rate being followed in the developing countries, one gets to know how working as a registered nurse in Canada can add pride, respect and financial advantages to one’s professional journey, making ways for you to flourish as a global nurse. The average salary of RN also depends on the qualification, level of education and the work experience gained in the field work. A nurse who begun working right after the graduation program will have a basic pay scale while a nurse manager who has completed a post-graduation program in a suitable specialty will have a higher pay scale because the job responsibilities being fulfilled are also high. It is important to lay stress on the environment of working before you make a final call about choosing to work at a particular place, in a region or a foreign country for that matter. Understanding the nature and style of working is important as it casts a path for improvement and future growth. Nurses should make sure to be in a mentally healthy environment as it helps them to perform their roles better. It is also important to keep a check on the working conditions so that there is no negative impact on the health of nurses which could further affect the quality of patient care being provided. Considering the widespread health care system in Canada, it is noteworthy that nurses in the country are comparatively in a better working environment as compared to nurses working in developing nations. Registered nurses in Canada are valued for their efforts and energy. They are given the liberty to make a decision in the best interest of their patient and also it is important to note that the profession of nursing is counted to be an important addition to the pool of highly preferred professions in the country. 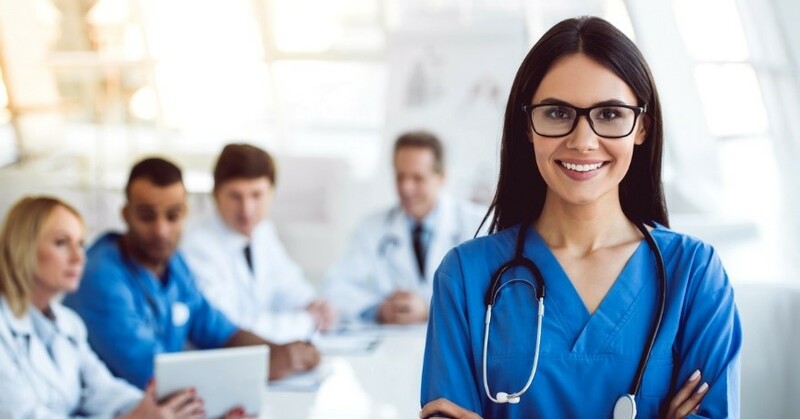 Well, after the details about working as a registered nurse, it is important to know about the reasons why Canada is on top of the charts when it comes to settling as a nurse. The country has a vast scope for nursing for both nursing students and aspiring nursing professionals. Whether you want to study nursing programs in Canada, opt for global nursing programs or even plan to settle as a registered nurse in Canada, there is a vast scope of opportunities waiting for you. Also, the ever increasing demand for healthcare professionals, makes nursing a highly valued career option in the list of leading career options in Canada. In Canada, once you start working as a registered nurse, there is a high possibility to tap permanent residency options which is an advantage not many of the developed nations provide easily. The country is immigrant friendly as about 20% of the population in Canada comprises of multi-cultural people, coming from different walks of life. In terms of scope of growth on a professional front, the immigrants with a history in healthcare are given a priority over other categories of skilled foreign workers, which makes it all the more in the positive light for aspiring nurses. However, one must not forget that one of the strong driving forces which bring you to Canada is the better life quality and better rewards from what you earn in your native land. In terms of talent recognition too, Canada stands to be a preference for the foreign workers. So, the information mentioned above states all that an aspiring nursing professional needs to know about the scope and possibilities of working as a registered nurse in Canada. Now is the time to tap the overseas working opportunities coming your way by simultaneously adding value to the skilled manpower of the country. Professional practices might vary but with the help of appropriate nursing programs, you can make it through. If you think, you fit the bill for all the things mentioned above, then take a step forward and reward yourself with a promising career as an international nurse in Canada.